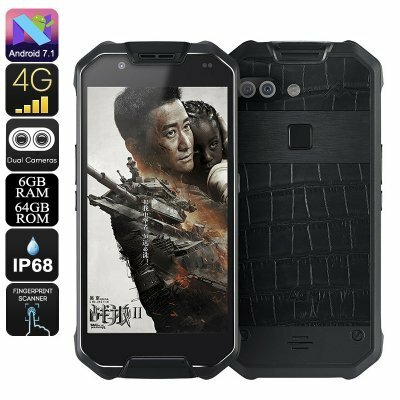 Successfully Added AGM X2 SE-Leather Rugged Phone- Android 7.1, Octa-Core CPU, 6GB RAM, IP68, 1080p Display, 12MP Dual-Camera, Dual-IMEI, 4G to your Shopping Cart. The AGM X2se is a fully rugged Android phone that is not only tough from the outside. This latest Android phone packs a Octa-Core Snapdragon CPU that has been clocked at 1.95GHz. With this piece of hardware, you can run all the latest programs and features without dropping a frame. The smartphone furthermore comes with 6GB RAM and 64GB internal storage. Thanks to this, there will be plenty of space for you to keep your favorite files and media. Whether you use it to browse the web, watch movies, or play the latest games – this Android phone is sure to meet your demands. It even comes with a 16MP front camera and Dual-Lens 12MP rear snapper that lets you snap breathtaking photos of all your upcoming outdoor adventures. With an IP68 rugged body, this rugged phone is fully resistant to drops and scratches. It furthermore is waterproof so you won’t have to worry about it accidentally getting wet. This rugged smartphone has been specifically designed for those of you that work in rough environments or spent most of your time in the out doors. It comes with a whopping 6000mAh battery that lets you use all its features throughout the day. From now on, you’ll be able to head into the wild with confidence. This rugged phone will handle the toughest of environments and it will keep you connected to the outside world throughout the day. In terms of connectivity, the AGM X2se won’t let you down. It comes with two SIM card slots and Dual IMEI numbers. The phone furthermore supports 4G. Thanks to this, you’ll always be able to use the fastest mobile data speeds no matter where you’re at. On its beautiful 5.5-Inch FHD display, the phone lets you use the stream media and download files at any given moment. Along with its Android 7.1 operating system, this rugged phone is guaranteed to treat you to an outstanding user experience. The AGM X2 SE Rugged Phone comes with a 12 months warranty, brought to you by the leader in electronic devices as well as wholesale Android smartphones..